I don't know about you ladies but for me footwear is all about comfort, even more so at the moment as my big toes recover from having ingrowing nails removed. And of course there's no better company than Clarks for producing comfy, well made & most importantly fashionable shoes. Now whilst my tootsies are recovering I'm supposed to be wearing sensible shoes but obviously I'm not wanting to rock the orthopedic look anytime soon so luckily for me I've been gifted some fabulous boots from Clarks that are not only of a sensible height, are also not too pointed in the toe department & most importantly of all are simply fab-u-lous! 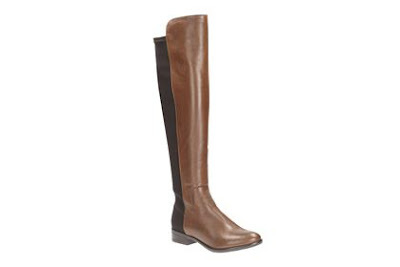 As you may have noticed over the past year or so over the knee boots are becoming more & more of a trend & not just in a Julia Roberts Pretty Woman way. Until now it's been a trend that I've loved from afar as I've just not seen a style that particularly appeals to me, preferring something fitted but not skin tight on the leg with a small block heel. But luckily for me I found some real beauties on the Clarks website. Something I was a little surprised by as I'll admit it wouldn't have been somewhere I'd have thought to looked for, for this particular style but they do in fact have two great styles. 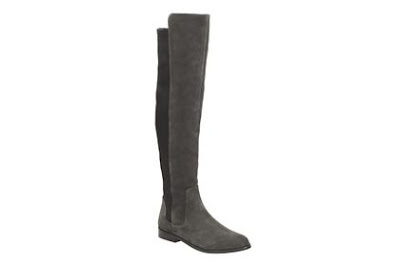 Firstly the Bizzy Girl in the most gorgeous shade of grey, which have a 2.5cm heel & an inner zip. And secondly the Caddy Belle boot, which is available in three gorgeous colours with a slightly higher heel (3cm), no zip & instead features a contrasting elastic panel down the back to not only make the boots easy to get on & off but to help ensure a great fit to your legs too. 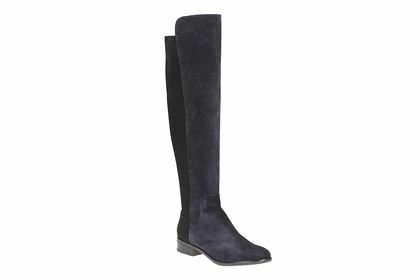 I would have loved any of the above 4 pairs & found it a really tough decision to choose which one to review but in the end I picked the Caddy Belle in navy suede as I find my blue ankle boots so useful & thought they'd look amazing teamed with some skinny denim jeans. So before I tell you what I think of them, here's a couple of close up pictures. As you can see from the above pictures the boots are the most gorgeous shade of blue & despite being someone who hates tight fitting clothing of any description the boots are really easy to get on & getting off is just as easy to, as you can simply just roll them down. They also fit nicely on my legs - not too tight to feel tarty or too loose to worry about them going bagy & they stay up perfectly. In terms of how high they come up the leg I'm 5'7" and they come to just over my knee. The main concern I had about the boot was that I was worried they would be hard on the back of my heels - a problem I seem to suffer from with most boots when new but I can honestly say there's no rubbing or discomfort with these. In fact I don't think I've ever worn a more comfortable pair of boots & that's with bruised toes that are still recovering from my recent procedure! Naturally I'm just having to wear my new boots today. 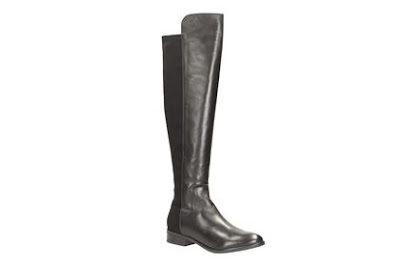 So ladies, what are your thoughts on the knee high boot? Anyone tried any? Perhaps you've already clicked the button on some? As always I'd love to hear your thoughts & finally a quick heads up - Clarks currently have up to £30 off selected adult boots see here. Boots no matter what shade or style are definitely a must have aren't they Lynne. I have to say I'm loving these over the knee pair & can't wait to start styling them with some different looks too! Thanks Michelle, I'm looking forward to styling them lots of ways & think I'm going to end up wondering how I managed without them! Hi that's great to know that the boots are in proportion to foot size. I'm totally in love with mine & think they're going to be so useful I could quite easily add a couple of other colours to my collection too! Are they large on the foot? Trying to work out size. They are lovely and look like 50/50s at a fraction of the price! Hi Cookie they really are stunning boots - I would say they're pretty true to size (although my toes are still heavily bandaged at the moment). If you're in doubt perhaps order a couple of sizes so you can compare? !